This tourism-related online calendar is intended to inform visitors about events that they may attend or participate in while visiting Greater Madison. Submissions must be events or activities that are open to the general public and must have a broad appeal to both residents and visitors. Events are not automatically posted. Events submitted are reviewed to ensure that guidelines are met and the information provided is complete. Destination Madison reserves the right to edit submitted text or reject submissions entirely. A notification email will be sent once the submission has been reviewed. To submit an event, please fill in the designated fields in the form below. Please be sure to include high-quality (at least 650px wide) photos that are in JPEG format. Anyone may submit an event. 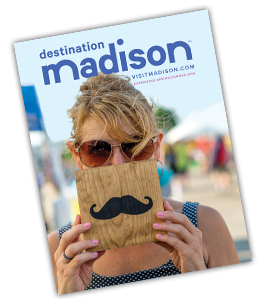 However, if you would like information about Destination Madison&apos;s partnership program, please contact partnership@visitmadison.com. When considering submitting an event, please review the checklist below. This does not guarantee that your submission will be accepted, but we hope that it helps you as you consider submitting your event! • Include an event link for visitors to find more information about the event. If your event meets all or most of the above, please submit for our review. Thank you!